Object of the Week: The ex-slave, the doomed barque and the American President. This week’s object, a ship’s passport relating to an American whaler, features the signature of American President Abraham Lincoln. A little research into the ship in question, Jireh Swift, opens up a myriad of stories of shipbuilders, whalers and the American Civil War – and somehow a connection to Australia. The barque Jireh Swift was built in 1853 by African American shipwright John Mashow (1805-1864), who was born into slavery in South Carolina. Freed in 1815, Mashow made his way to New England and went on to become a well-known and respected shipbuilder, designing more than 100 ships and building around 60, including 14 whaleships such as Jireh Swift. Many of these American whalers would find their way to Australian waters, drawn to the abundance of whales along the coasts, the shipyards in our harbours and the trading opportunities of our local ports. The passport itself is in four languages and was used to confirm the nationality and legitimacy of the vessel and its crew. The document includes the statement ‘the vessel Jireh Swift… is of the United States of America, and no subject of present belligerent Powers have any part or portion therein…’. 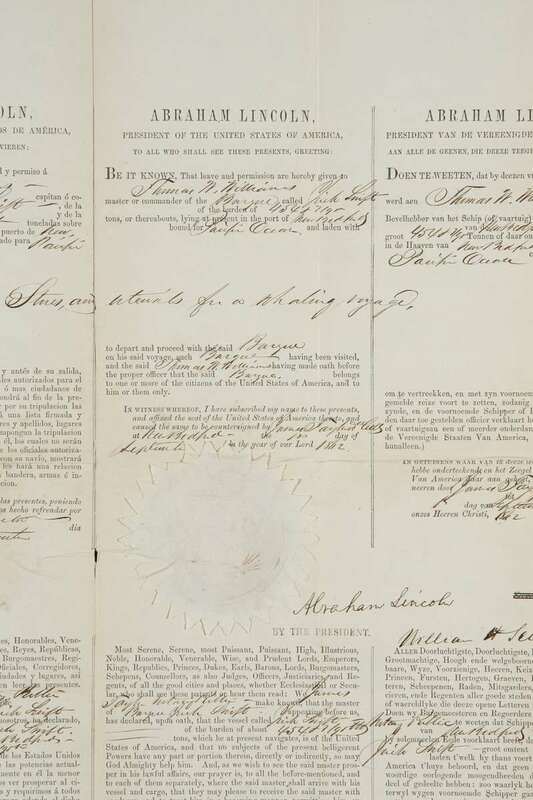 The passport is dated 1 September 1862 – a year after the commencement of the American Civil War, and three years before the assassination of the president whose signature it bears. The war between the American southern states (the Confederacy), who objected to Lincoln’s 1860 election to President and (among other things) his stance on slavery, and the Union, the 25 states who supported the federal government, lasted four years between April 1861 and April 1865. Although most of the conflict occurred on land, it did reach the sea and in turn impacted whalers like Jireh Swift, even as the vessel worked miles away in the Bering Sea. At the outbreak of war the Confederacy found itself in the unenviable position of having almost no naval strength. Not in a position to engage the Union in a naval battle, it employed a different tactic – to seek and destroy as many merchant and whaleships as possible in an effort to cripple the Northern economy and force the Union’s powerful naval contingent out to sea. Among the Confederacy’s small naval force came the ship Shenandoah. Captained by the charismatic Confederate States Navy Commander James Waddell, Shenandoah was an iron-framed clipper ship that also employed auxiliary steam power. Above all, the ship was fast. 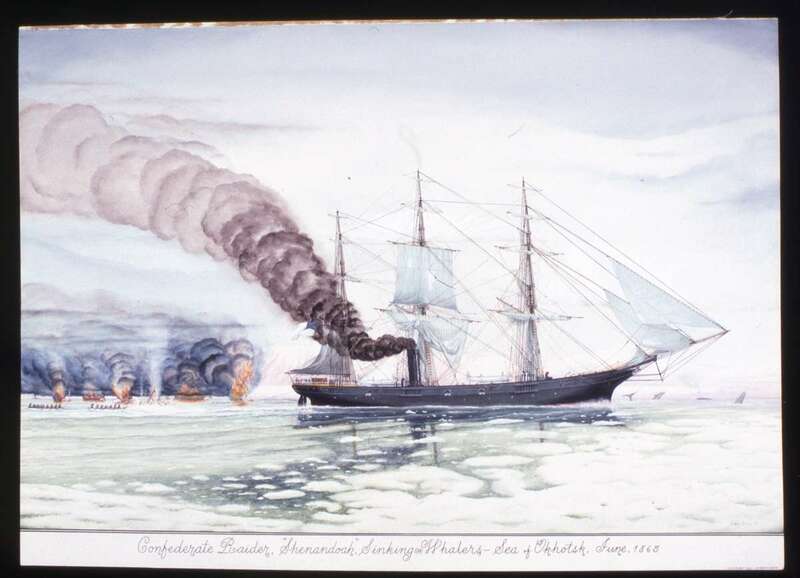 Waddell took command of the ship in October 1864, and within six weeks had captured eight merchant and whaling vessels, most of which he scuttled and set alight. In January 1865, Shenandoah was discovered to have a damaged propeller. Waddell directed his ship south for repairs and on 25 January, Shenandoah entered the Australian port of Hobson’s Bay, Melbourne. The Australian authorities tentatively allowed Waddell and his men to enter the port and restock, mindful of Britain’s commitment to a neutral stance on the war, but in opposition to the complaints of the US Consul. Publicly Shenandoah was an instant sensation. News of Waddell’s raids had reached Australia and people turned out in their thousands to tour the ‘pirate’ ship and a gala ball was held in Ballarat to host the officers. Shenandoah left Melbourne in February 1865 and Waddell, reluctant to contradict Britain’s Foreign Enlistment Act by employing British subjects and despite the fact that 17 of his crew had deserted in Australia, rejected a great number of offers from locals who were keen to join him. Once Shenandoah was out to sea, however, around 45 Melbourne stowaways emerged from various crevices in the ship and Waddell consented to their enlistment. After leaving Australia Shenandoah made its way to the Bering Sea capturing a further 30 ships (altogether releasing six on bond and destroying 32). Together with the 38 ships, Shenandoah took 1,053 prisoners – all without the loss of a life. On 22 June 1865 Jireh Swift was destroyed after leading Shenandoah on a chase through the ice fields of the Bering Sea. 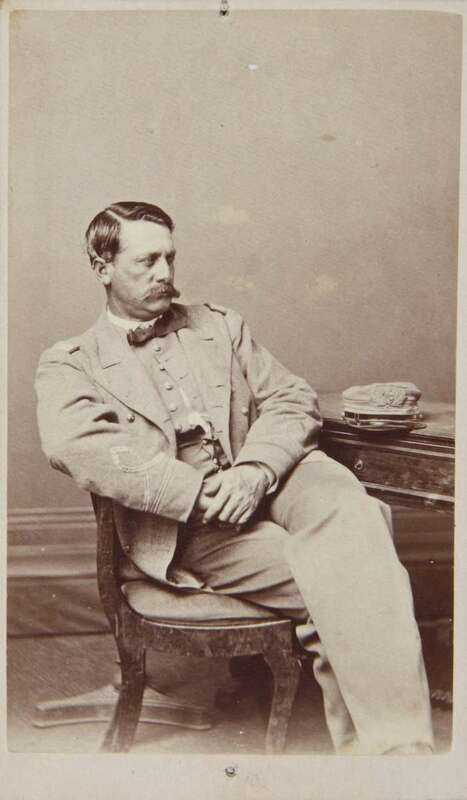 It is quite probable that the last shots of the Civil War were fired that day, directed at Jireh Swift as Waddell, having been away from America for many months and lacking fresh news of the war, was not aware of its conclusion weeks earlier. It was in early August after contact with the British ship Barracouta that Waddell learned of the surrender of the Confederate forces and that he and his crew were now being hunted as pirates and traitors by the US Navy. Waddell must have known that surrendering in an American port meant probable death and so he stripped the ship of all weaponry and lowered the steam engine’s stack to give Shenandoah every appearance of a regular merchant ship. In this way Waddell and his crew made it to England without being recognised and, after a brief detention, they were released. Several years later, in 1871, a tribunal was set up in Geneva to assess the United States’ claim against Britain for damages inflicted on American shipping by British-built or assisted Confederate ships. In the case of Shenandoah, the tribunal found Britain responsible for all acts committed by the ship after leaving port in Melbourne (restocked, repaired and re-crewed), including the destruction of Jireh Swift. To see other collection items relating to Jireh Swift, Shenandoah and James Waddell you can visit our eMuseum here.